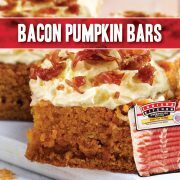 Talk about sensory overload.Pumpkin season is upon us and so will be a speechless, eye-popping expression when this guilty pleasure hits the palate.Of course, it can only be fully enjoyed with Indiana Kitchen bacon. Cook the bacon by laying strips of bacon on several rimmed baking sheets or casserole dishes. Place in a cold oven, then set temp to 400 F. Bake until desired doneness, about 15-20 minutes. Place cooked strips on paper towels and allow to cool. Reduce oven temp to 350 F.
Mix brown sugar, granulated sugar, oil, pumpkin and eggs together until smooth. In a separate bowl, mix flour, baking powder, baking soda, cinnamon, cloves, and ginger until combined. Mix wet and dry ingredients until combined, then add bacon if desired (adding bacon to batter is optional). Pour batter into a greased 9” x 13” pan. Bake for 30 min. or until toothpick inserted in the center comes out clean. Allow to cool. While batter is baking, mix softened butter and cream cheese together until smooth. Add maple syrup and mix. Add powdered sugar in ½ – 1 cup increments and mix until you reach your desired level of sweetness. 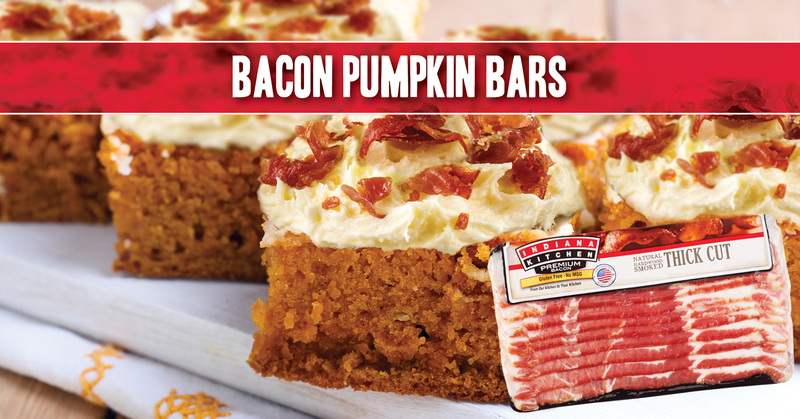 Spread frosting thickly over cooled pumpkin bars. Sprinkle with bacon chunks. Serve and enjoy!